Whether you are in survival mode as a new teacher, just back in the classroom after maternity leave, getting over an illness, or have 20 years experience under your belt, where do you find the time? In my opinion, just like investing money earns interest (or at least it USED to earn interest, ha! ), you can invest time in getting organized to save yourself time later on. You can make sure that everything in your classroom has a place and label things so student or parent volunteers can help you. Shelly Bailey gets parent volunteers to come help her in her classroom at least once per week! Also, I always keep digital files of lesson plans, rubrics, study guides, and tests so I can pull them up and "tweak" them according to whatever I happen to be doing. You don't have to "re-invent the wheel!" **Mrs. Matott has some really good time-saving/organizational tips on her blog, Got Art? **Jessica Balsley also has some great tips for saving time at theartofeducation. 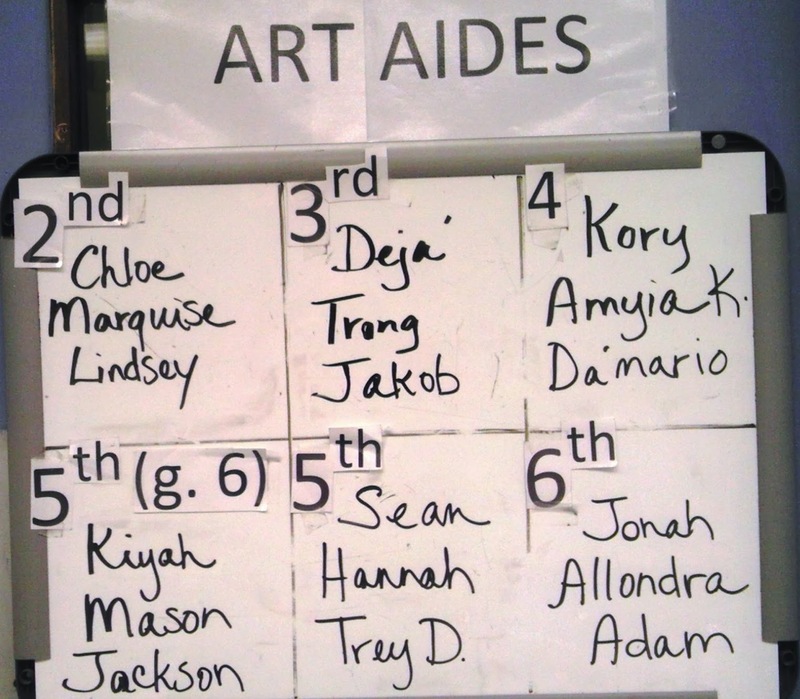 Another thing that helps me save time is to assign "Art Aides." I rotate the helpers once per week so every kid gets a turn helping pass out materials, running errands, hanging artwork, etc. This is written on a small dry-erase board that hangs permanently on one of my classroom doors. (I teach 7 classes, but the enrichment class isn't listed on the chart). I hardly ever have a student who doesn't want to help, and usually the kids who have behavior issues are so delighted they are being given some responsibility that they behave themselves (at least for that week :). In her book, A Retired Art Teacher Tells All, Marlene Johnt takes this a step further and assigns her student monitors a grade for their work. She says if she cleans up after all her kids at the end of each day there would be nothing left but a shell of an art teacher! We all know how true that is! "Biggest concern- so many students, so little time! Having just 30 minutes with K-5 makes it hard to do clay and sculpture activities. Trying to work in the messier, ‘harder’ production lessons is a challenge with fundraiser deadlines, art shows, etc. 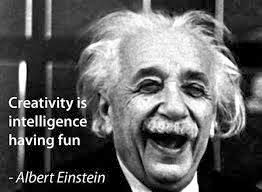 Add working in art history, literacy, math, and science connections and it seems like there is less and less time for messy exploration/learning from mistakes. You want art to be a little more organic than other classes but sometimes it is difficult to meet goals if you loosen the reigns of a schedule too much." "Biggest Concern- Planning for students that miss class A LOT. Intervention and absentees make up the biggest part of my headache. Constantly catching kids up and having to stop and explain an entire day of class in about 3 minutes." #1 concern: Time. Time to do a good job teaching, planning, promoting our program, getting colleges in to speak with the students, organizing/hanging/taking down art exhibits, and all the other things that teachers have to do - paperwork, grading, etc. A high school teacher writes, (My number one concern as an art teacher is that) "Many art teachers do not take the time to develop their own art production." "Biggest concern- so many students, so little time!" This is my biggest concern too and I don’t know that there is any one solution! One thing I tried this year was making a yearly plan. This plan is a working document and has changed a lot during the year and will continue to change as the school year goes on. 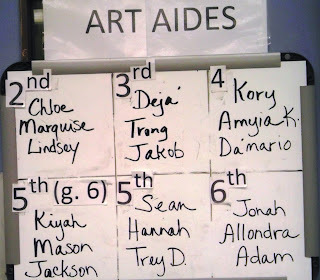 However, starting out this way helped me make sure I hit various areas I thought were important (elements of art, art history, multiculturalism, arts integration, TABS choice/experimental more free art, assessments, art and technology, art careers, art contests, etc…). I started the year out with an intensive lesson on the elements of art and followed that up with an accompanying assessment. Then I moved onto 2D art production and then 3D with some grade levels. Throughout I have done art contests and art and technology…the way I made time for this was to send home art contests and to work in small groups on art and technology with students that finish a project early, while the rest of the class finishes up the previous project. At first I didn’t like this idea, of moving on and leaving some out…however, they are in the same classroom, so some of them will learn about the art and technology through proximity and it helps keep those kids who are finished on task and moving forward. I wrote it up in my yearly plan to do the more messy exploration in the form of TABS choice in the last month of school. This way, my school-wide art show will be over and we can be more free and relaxed in our art productions. It also made sense to me to do this at the end of the year because students will have had plenty of lessons on proper art techniques and material safety to have “earned” a more choice based art experience. IN RESPONSE: An elementary art teacher writes: "Biggest concern- so many students, so little time!" Another idea I had for maximizing classroom time is to try and convince my administrator to change my schedule to where I see students every other week for an hour as opposed to every week for 30 minutes. While I would hate to only see them every other week, I feel so much time is wasted during weekly 30 minute classes in passing out materials, reviewing instructions, clean up and transitions. I haven’t been successful yet in making this happen, but I have learned that often diligence pays off. My principal agrees that I don’t have enough time to accomplish all I need/want but hasn’t found a way to make it work in the schedule. I am going to continue to ask for this and maybe sometime it will happen! You could try asking for this too and see if you can get fellow resource or “activity” teachers on board with you. Good luck and it you figure out any tricks please share them with the rest of us! "Biggest Concern- Planning for students that miss class A LOT. " Consider having certain responsible/bright students assigned to explain to their fellow classmates your instructions if somebody comes in late. I’ve also heard of some schools having an alternate schedule to use on days that have special events, assemblies, intervention, etc. For example, everything would be shifted up 5 minutes to make room at the end or beginning of the day so that not just one class is affected. So each class would be 25 minutes instead of 30. Don’t know if this is feasible for your school or if it even speaks to your concerns, but just a thought! IN RESPONSE: A high school teacher writes, (My number one concern as an art teacher is that) "Many art teachers do not take the time to develop their own art production." I agree, and I realized this myself a couple of years back when my boyfriend observed that I wasn’t spending much time on my own creative endeavors. He even offered to “go away” sometimes or “give me some space” because he was concerned that our relationship had taken away my valuable art making time. I kindly explained to him that it wasn’t that, but rather that by the time I get home from school I am so exhausted and “creatively drained” that the last thing I want to do is to pick up a paintbrush or think about anything art related. Spending all day in the classroom in my art frame of mind leaves me all dried up creatively. So, I decided I would “plan ahead” and designate holidays and summer breaks to create. Each summer I set a goal of what I want my focus to be on that summer. Three years ago, I decided I was going to paint x number of paintings and helped hold myself accountable by purchasing all of the materials before summer break began. The next summer I decided to designate time to professionally photographing my work, beefing up my artist resume, and submitting it to various galleries around the state. I ended up getting offers to exhibit my artwork in three separate galleries from this; one of them being my first solo exhibition. Having these exhibitions planned also motivated me to continue creating into the school year. Having a deadline and end goal helped me a lot and I found new sources of inspiration and creative energy! I also like to “craft” a lot during the holidays and started signing up for various art festivals and craft fairs to exhibit and sell my new creations. Eventually, I had to take a step back though because I signed up for so many events in my excitement that in the long run I started to dread them and feel overextended. The trick for me, I’ve found, is finding the right balance. Picking one or two small creative goals each summer has helped me a lot. I personally find it difficult to include messy media such as paint and clay. This issue is compounded by the fact that I split my time between several schools, which means that the facilities available to me are different on a day-to-day basis. That makes planning a nightmare. The typical way that I get around this is just to include excessive amounts of time in my plans for clean-up. Since it’s impossible for everyone to clean up these kinds of supplies at the same time, I usually offer some kind of free-drawing or finish-the-picture type of activity for students who are first to clean up, while they wait for everyone else to finish. This makes any paint/clay projects take several weeks to finish, but at least they get around to it eventually and don’t totally miss out on the good stuff. I currently teach K-4 at one school of 1300 students. I used to travel amongst schools. I did not look forward to that. It certainly adds another level of challenge to an already challenging profession. I always avoid clay. Mostly because of the storage issue. However, I paint quite frequently with my students. I do have running water in my class and as crazy as it is there are many teachers that do not. Those teachers have to spend extra time with buckets of water. I rarely use liquid mediums with my students. Perhaps you are familiar with tempera cakes and concentrated watercolor. Those two products have changed the way I teach. I am much more willing to allow them to paint because the clean-up easier and I get great results from the products. I usually do all the clean-up (wiping tables, clean brushes, clean containers, etc.). I try to keep the students working at the same pace. Of course that is usually a fast pace because of time constraints. I have included a link to the products I was describing from School Specialty. for an art teacher to teach, prepare, clean, and display art effectively. Currently, I see my students for 40 minutes every other week. I imagine that time will shrink unless things change. There is no foreseeable change in the near future. can be scheduled around a particular grade level on a given day and teachers plan their class events on days so they will not miss my class. (like cutting paper) or assistance with hanging bulletin boards. you and you can only do so much. One of my teachers always told me, "work smarter, not harder."